Fluoro Polyers are fluro carbon based polymers with strong carbon fluroine bonds. 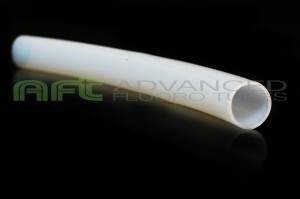 AFT PTFE tubing is smooth, non porous and dimentionally stable. Unlike other plastic material this PTFE tubing is unaffected by solvents, acids and fuels. Further more its no affected by weather or UV exposure. PTFE tubing has Durometer of 58 D and outstanding dielectric properties. non-corroding, non-oxidising and non-stick and has a best in class UL94 V-0 flame rating. It has highest working temperature of any fluoropolymer tubing available today enduring temperatures upto 260 Degree Celsius. It can also withstand as low as -60 Deg Celsius. It is widely used as pressure tubing in general chemical applications. It also serves numerous applications in the automotive, electrical and appliance industries.